Redesigning your kitchen can be tricky. Not only do you have to think about finance, timing and space, but finding a kitchen style that you actually like can be tough. With so many different designs splashed across every home-design website/magazine/showroom, trying to find one that you truly like can seem like a daunting task. And that’s why this blog is here. We’d be writing a blog longer than War and Peace if we were to even cover half of all the designs out there, so for now, we’re going to cover some of the most classic kitchen styles. These are a great place to start if you feel a bit lost looking at so many different designs. If you’re not a fan of sharp modern lines or cooler colour contrasts, you can’t go wrong with a more rustic kitchen style. To create a warmer feel, rustic designs often take advantage of simple wooden elements and less vibrant colours. For a full rustic design, take advantage of all the design elements you can. 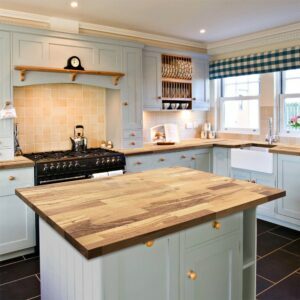 Why not add some painted timber knobs to your units or invest in a wooden worktop to give your kitchen some real countryside charm? A well organised space is a key feature, so open shelving and other clever storage solutions are usually prominent features of the design. The shelving gives you the space to show off fun decorations as well as being handy storage space for frequently used utensils. If you have a number of large cooking aids or pieces of crockery, a lemans is always useful as it can fit a number of items and makes them easier to grab when cooking. Plus, it means you won’t risk an avalanche of pots and pans by grabbing something from the back of the cupboard. Find more clever storage ideas HERE. If you choose a more rustic style, you certainly aren’t limiting yourself on colour either. While colours in these kitchen designs are usually kept to a simple primary palette, you can still get creative with the shades you use. You could mix pastel blue cabinets with white worktops or appliances for a fresh sunny design, or experiment with muted greys and other monochrome colours for a subtler look. 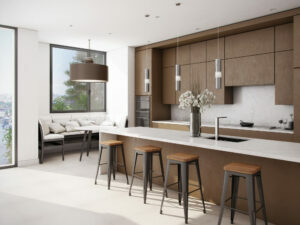 If you’re tired of the clutter and stress of life, you can’t go wrong with a modern minimalist kitchen design. Minimal doesn’t mean going without. It’s all about investing in items and design aspects that can do several jobs while also looking good in your space. As a room that often sees a lot of mess, it’s a great design choice for those who are looking to create a more functional area. The first thing to do is go through the space and think about what items you really need. Many of us end up with quite the collection of mugs, bowls and old cookware that we’ve hoarded over the years. Think realistically about how many of these items you actually need and then start to cull the excess. When it comes to appliances and other kitchen gadgets, think about when the last time you used it was. If you’re hesitant to get rid of any, perhaps because of its value, try moving it to another storage space in the house instead like the loft or garage. Once you’ve cleared out, the redesign can begin! To minimise bulkiness and clutter, try handless units or smooth-opening cupboards and drawers to really give your space a modern chic. When it comes to colour and other aspects of the design it’s all about personal preference. If you’re looking to capture a real modern vibe, then you can’t go wrong incorporating on-trend shades like soft greys and vibrant splashbacks in deep pinks and blues. See our full colour guide HERE. Kitchen trends come and go like busses, so if you’re looking for features that will stand the test of time, then there are always a tonne of traditional styles to choose from! The word “traditional” can mean a lot of things when talking about kitchen style with many designs having stuck around in the public consciousness since their debut, so we’ll just cover some of the more popular features of the past few decades. Neutral colours with glass front cabinets: These kinds of cabinets always bring a sleek airy feel to any space, plus you can always display your crockery and glasses in a nice neat fashion inside to add style and to see which utensils you have available. White colour scheme with wooden accents: As we said previously, wood can bring a real warmth to your space, so offsetting it with a cooler colour like white can make be a great kitchen style choice. If you have white walls, the easiest ways to incorporate wood is through your worktops, chairs and accessories. If you’re wondering about what kind of wood will work best in your kitchen, we have another blog all about it HERE. Grey accented modern kitchen: While many see grey as a drab colour, it hasn’t gone out of style when it comes to kitchen designs yet and it doesn’t look like it’s going anywhere either. Pair darker grey units with a light floor and white worktops to create a truly soft look. If you’re room is smaller, be sparing with the darker shades as it can create the illusion shadows and make your kitchen feel more cramped. Plain kitchen with colourful accessories: For those who don’t want to commit to a completely outrageous design, plainer kitchens with bolder accessories have always been a staple choice. If you stick to a more monochrome colour scheme, brighter colours in the form of display crockery, vases, lamps or art pieces will make a nice contrast. The only rule here is to not go overboard with too many different colours or it can end up looking a mess. Ready to take the plunge and change your kitchen style? 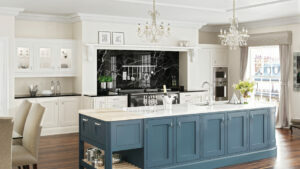 Make sure to pop over to our Essex showroom and let us design your dream kitchen for the new year!